Peterhead and Clyde took advantage of Edinburgh City being in Challenge Cup semi-final duty by narrowing the gap at the top of Scottish League Two. Peterhead's 2-1 win at home to Queen's Park means Jim McInally's side are a point behind with a game in hand. Clyde's 1-0 win over Albion Rovers in Cumbernauld is enough to move them to within three points of City. Annan Athletic beat Cowdenbeath 4-2, while Elgin City came from behind to defeat Stirling Albion 3-2. Peterhead got off to a flyer when Shane Sutherland fired them into a third-minute lead. Scott Gibson's close-range finish levelled the game shortly after the break, but Willie Gibson fired the Blue Toon's winner six minutes later. Mark Lamont shot Clyde in front after only 23 minutes and that was enough to extend the Bully Wee's unbeaten run to 13 games as bottom-placed Rovers suffered a sixth consecutive defeat and 17th game without a victory. Fourth-placed Annan kept pace with two sides above, with Chris Johnston and Aidan Smith both scoring doubles as they twice came from behind and hit the net twice in the closing minutes of a thriller at Central Park. Fraser Mullen's free-kick found the top corner for Cowdenbeath after 11 minutes, but Johnston fired an equaliser shortly after. Kris Renton shot the Blue Brazil back in front after 34 minutes, but Smith headed Annan level again after half-time. Johnston shot his side into the lead with three minutes left of normal time and, after Luc Bollan was sent off for violent conduct, Smith fired his second deep into stoppage time. 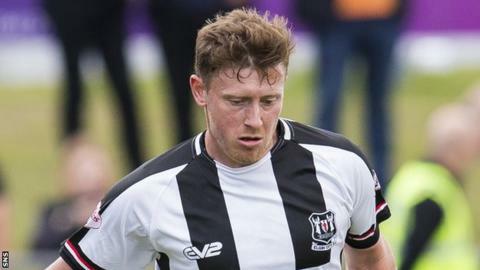 Brian Cameron scored twice for an Elgin side who found the net twice in the final 10 minutes to beat Stirling and move to within two points of the fifth-placed visitors. Max Wright fired Stirling into a sixth-minute lead, but Cameron's shot ensured the sides were level at the break. Dylan Mackin's header restored Stirling's advantage before Cameron fired another equaliser and Kerr Hay shot the winner with a minute left of normal time to end the visitors' seven-game unbeaten run.